Thousands of years have passed since humankind abandoned the city--first for the countryside, then for the stars, and ultimately for oblivion--leaving their most loyal animal companions alone on Earth. Granted the power of speech centuries earlier by the revered Bruce Webster, the intelligent, pacifist dogs are the last keepers of human history, raising their pups with bedtime stories, passed down through generations, of the lost "websters" who gave them so much but will never return. With the aid of Jenkins, an ageless service robot, the dogs live in a world of harmony and peace. But they now face serious threats from their own and other dimensions, perhaps the most dangerous of all being the reawakened remnants of a warlike race called "Man." In the Golden Age of Isaac Asimov and Robert A. Heinlein, Clifford D. Simak's writing blazed as brightly as anyone's in the science fiction firmament. Winner of the International Fantasy Award, City is a magnificent literary metropolis filled with an astonishing array of interlinked stories and structures--at once dystopian, transcendent, compassionate, and visionary. 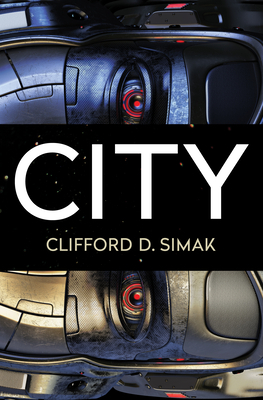 During his fifty-five-year career, CLIFFORD D. SIMAK produced some of the most iconic science fiction stories ever written. Born in 1904 on a farm in southwestern Wisconsin, Simak got a job at a small-town newspaper in 1929 and eventually became news editor of the Minneapolis Star-Tribune, writing fiction in his spare time. Simak was best known for the book City, a reaction to the horrors of World War II, and for his novel Way Station. In 1953 City was awarded the International Fantasy Award, and in following years, Simak won three Hugo Awards and a Nebula Award. In 1977 he became the third Grand Master of the Science Fiction and Fantasy Writers of America, and before his death in 1988, he was named one of three inaugural winners of the Horror Writers Association's Bram Stoker Award for Lifetime Achievement. DAVID W. WIXON was a close friend of Clifford D. Simak's. As Simak's health declined, Wixon, already familiar with science fiction publishing, began more and more to handle such things as his friend's business correspondence and contract matters. Named literary executor of the estate after Simak's death, Wixon began a long-term project to secure the rights to all of Simak's stories and find a way to make them available to readers who, given the fifty-five-year span of Simak's writing career, might never have gotten the chance to enjoy all of his short fiction. Along the way, Wixon also read the author's surviving journals and rejected manuscripts, which made him uniquely able to provide Simak's readers with interesting and thought-provoking commentary that sheds new light on the work and thought of a great writer.